From plant and animal breeding to genetic modifications to creating new kinds of energy resources, it is impossible to design improvements without understanding the relationship between molecular sequences and their structure and function. As we contemplate new ways to produce food and energy, understanding molecular structures is critical to both target development and follow on manufacturing processes. Additionally, to have large-scale benefit, our emerging scientists, the technical workforce, and society need to have knowledge of the sequence/structure/function relationship. Modern data collection technologies are creating enormous data resources that can be used to help students, and scientists, understand these relationships, but currently are underutilized. This is due to the fact that easy-to-use tools that meet teachers’ needs for clear instruction are not yet commonplace. Filling the gap between the embarrassment of data riches and practical classroom use requires three things: user-friendly tools, content that demonstrates specific applications with interesting stories, and packages that combine instruction, assessments, and inquiry-based investigations. Digital World Biology is addressing this need with its on-line courses and mobile apps. The on-line courses increase students’ computer literacy while using standard tools like Cn3D, Blast, ORF finder, and multiple databases, in directed and exploratory ways, and help students better understand biology as well gain a better appreciation for the value of the data and the field of bioinformatics. 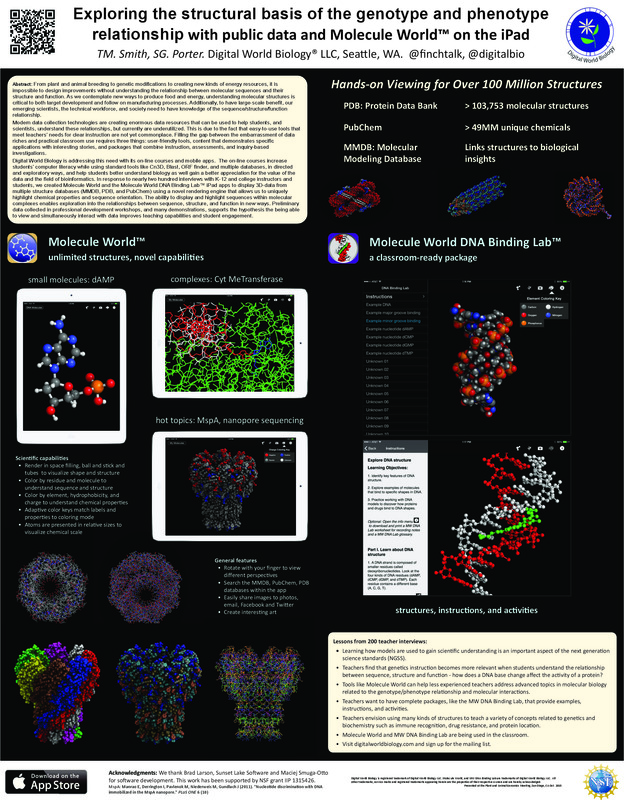 In response to nearly two hundred interviews with K-12 and college instructors and students, we created Molecule World and the Molecule World DNA Binding LabTM iPad apps to display 3D-data from multiple structure databases (MMDB, PDB, and PubChem) using a novel rendering engine that allows us to uniquely highlight chemical properties and sequence orientation. The ability to display and highlight sequences within molecular complexes enables exploration into the relationships between sequence, structure, and function in new ways. Preliminary data collected in professional development workshops, and many demonstrations, supports the hypothesis the being able to view and simultaneously interact with data improves teaching capabilities and student engagement.